Hi all. 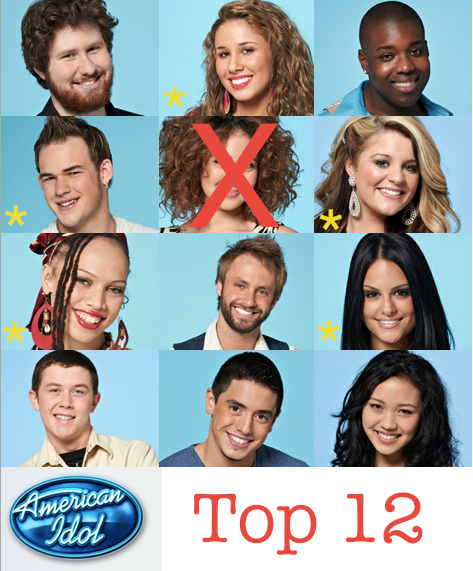 Its time for the American Idol report! I would like to apologise for the slight delay, but I’ve been a bit sick and as a result have not much felt like writing. But I am feeling a little better so I thought I would get cracking on my report. You should know the drill by now, but for the sake of any newcomers this is what I shall do. First I’ll review each performance and then I’ll discuss who went home. Naima Adedapo started the show off and fell a little bit flat. The arrangement was a little weird and her voice was not great at all. Paul McDonald annoys me more every week. He’s one of those voices that is cool the first couple of times you hear it and then the novelty wears off. And the novelty has worn off completely. Plus I’m still mildly disturbed by his movements on stage. I thought briefly that I might like Thia Megia a few weeks ago. Unfortunately the arrangements she’s had recently have just not been right. She did sing decently this week, but, as much of a classic Disney animation fan as I am, the song was not right for her. I’m a huge James Durban fan, but this week’s performance had its ups and downs. It was great though, and he is such an awesome performer. Haley Reinhart is growing on me more and more every time she opens her mouth. And I completely disagree with the judges; she does not need to stick to one genre. She can do them all, and that is one of her strengths. Her voice has this quality that just gives me goosebumps. Do I really need to talk about Stefano Lagone? I really don’t get him, or what the judges love about him. He gives me this urge to throw something – preferably at him. I don’t know what the hell was going on with her stage arrangement, but Pia Toscano is fantastic and she gave another solid performance this week. Scotty McCreery was Scotty McCreery. Good, not for me though. My first thoughts on Karen Rodriguez was that she looked like she belonged on the set of a bad Star Trek movie. My second thought was that she was once again, painfully average. Casey Abrams took a giant step backward in my head this week. I’m not a huge Nirvana fan to begin with and I’m just looking for reasons not to like Casey so I really hated this performance. My candidate for worst performance of the week. Lauren Alaina makes my heart melt. She completely made up for an ok week last week and gave a fantastic performance. My candidate for best performance of the week. I do not like Jacob Lusk’s voice, it sounds to me like pre-op transexual Cher if she was taking hormone supplements to become a man. Hence I think it goes without saying that I hated his performance. Come results night the bottom three were Haley, Naima and Karen. I was disappointed to see Haley in the bottom again, but thankfully she was safe and Karen Rodriguez was eliminated this week. It didn’t really surprise me, she hasn’t made too much of an impression and I won’t miss her much. What did you think of the Top 12 this week? Did you think the right person went home? Who are your picks for best and wort performance of the night? Hit the comments or share your thoughts with me @CDWB on Twitter. And please tune in next week for my American Idol Report. ~ by CDWB on March 20, 2011.